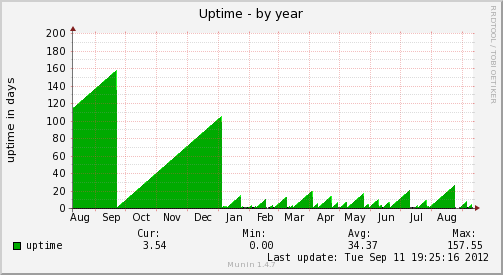 The following 1-year recordings of uptime and kernel version have been obtained on a VIA EPIA-V board that is equipped with a CentaurHauls VIA Samuel 2 CPU running at 533 MHz. There is little doubt that this instability with an average uptime of about 10 days was introduced when upgrading from version 2.6.33.9-rt31 to 3.2.2-rt10. Apparently, the upgrade to version 3.2.23-rt37 did not help. Unfortunately, the histogram analyses do not provide any hint towards the origin of the crashes in this particular case, since no time clusters of the crash times can be established. 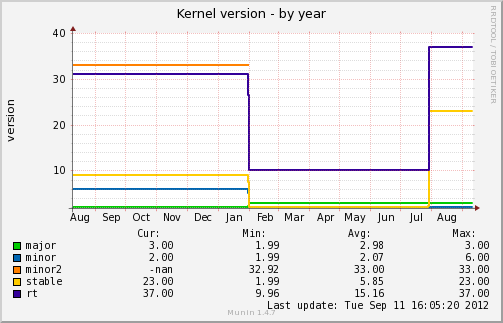 An instability of unknown origin was introduced when upgrading from the 2.6.x to the 3.x kernel series. Since the system does not produce any output when crashed – even not when forced using a SysRq command – specific hardware instrumentation may be required to elucidate the origin of this instability.